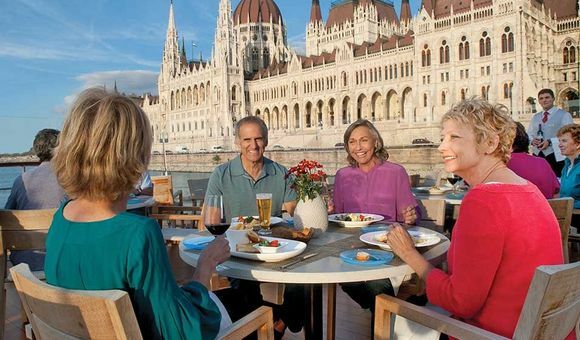 Take an unforgettable cruise to the best destinations in the world with Viking River Cruises. Experience the Swiss-trained staff and the elegant Scandinavian decor. Viking River Cruises is the world leader for river cruises in exotic locations worldwide. From the fairy-tale castles of Bavaria to the Great Pyramids of Giza, a river cruise is the perfect way to explore your dream destination during a relaxing vacation. Viking sails to far-away rivers in Europe, Asia and Egypt, allowing passengers to visit anywhere from modern Western metropolises to the majestic mountains of Tibet. Enjoy long stays in ports and the opportunity to see a new city every day on a relaxing river cruise. For first-time cruisers and experienced ocean travelers alike, a river cruise is sure to be the experience of a lifetime. Viking River Cruises ships are known for their small size, allowing for a more intimate cruise experience. Some of their Longships hold fewer than 200 passengers, meaning no crowded decks or waiting in line. The décor lends a relaxing and open atmosphere with its understated elegance and Scandinavian charm. Passengers can enjoy fine dining at the Aquavit Terrace Restaurant, found on nearly every Viking ship. The restaurant can be converted to an open-air sun deck or protected behind retractable floor-to-ceiling windows, depending on the weather. On most vessels, every stateroom has a view to the outside. Cruise on board the state-of-the-art Viking Heimdal to experience the most picturesque European river destinations in the epitome of Scandinavian elegance. Cruise Europe’s most picturesque river destinations in the epitome of Scandinavian elegance on board the Viking Jarl longship. Cruise the European rivers in Scandinavian luxury on board the Viking Tor, where elegant staterooms, exciting entertainment, and exquisite dining experiences await you. Viking Cruises was initially founded in 1997 and is the parent company of Viking River Cruises and Viking Ocean Cruises. With a constantly growing fleet, Viking Cruises offers river and ocean cruises for the travelers with a great interest in history and culture. With the debut of the innovative Viking Longships has created new standards in the world of river cruising. Cruising enthusiasts admit that cruise experience with Viking Cruises is quite different from everyone else’s. Looking for adventure? Sailing to the most enticing destinations, Viking Cruises allows you to explore the world up close and in depth. One of the most important investments of Viking Cruises is their staff – thoughtful, attentive and welcoming cruise attendants. Friendly and always smiling staff will make your cruise unforgettable. When it comes to activities, Viking cruises encourage you to dip a toe into onboard entertainment – theatres, outdoor cinemas, and world-class lectures. Relax in comfortable and stylish Scandinavian spaces – have a cup of tea in the quiet Wintergarden or unwind in a Nordic sanctuary of wellness – Scandinavian spa. Since 1997 Viking River Cruises has become the world’s leading and fastest growing river cruise line. There is certainly something magical about the European rivers. By choosing one of the European river cruises you will have a great chance to discover intriguing and usually little-known ports of picturesque European waterways. Operating a fleet of 25 vessels, Viking River Cruises also offers a classical experience – Rhine river cruises and Danube river cruises. If you are a curious traveler, consider Egypt your next travel destination. Uncover the ancient secrets of Egypt, the land of pharaohs, tombs, and mummies. A real archaeological paradise! Nile cruises create a rewarding and educational traveling experience like no others. Take a tour to admire massive glaciers and misty fjords in Alaska. This Alaska cruise allows you to spend more time enjoying majestic scenery and natural beauty. If Alaska is too cold for you, set sail for the sun-kissed beaches and legendary cities as you cruise the Caribbean and West Indies. Today, Viking Cruises operates a fleet of more than 60 deluxe vessels that were designed to cruise the world’s most beautiful rivers and oceans. Intimate and thoughtfully created Viking Sea and Viking Tor are the most stylish way to see the world. Come aboard and experience beautifully designed suites and fine dining restaurants.